DANVILLE, Calif. – May 29, 2018 – National non-profit The Crayon Initiative has partnered with arts & crafts retailer A.C. Moore for a second year to host a crayon collection drive in all of its 135 store locations from June 24 – August 4, 2018. Teachers, students and parents are encouraged to collect used or unwanted crayons from the classroom or home and drop them off at any A.C. Moore retail location. The donated crayons will then be recycled and distributed to art programs at children’s hospitals across the U.S. by The Crayon Initiative. 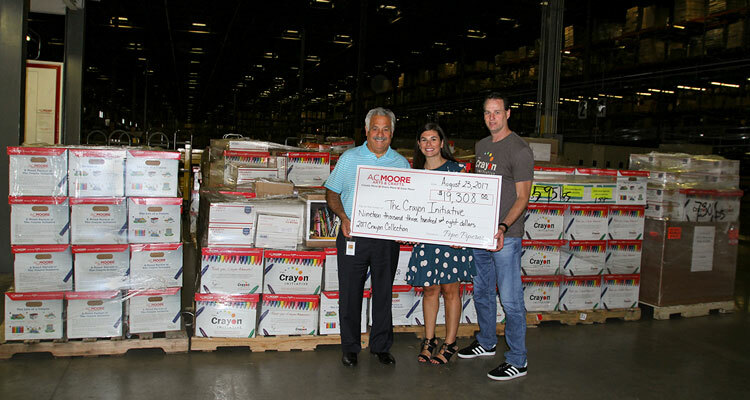 Last summer, A.C. Moore helped collect more than 19,000 pounds of used crayons, and the A.C. Moore Foundation donated $25,000 to The Crayon Initiative. The crayons were sorted and used to create 95,000 fresh new packs that were then donated to children’s hospitals across the country. Countless children engaged their schools and communities in the crayon collection to help make a difference and reduce environmental waste. This year, the A.C. Moore Foundation is pledging to donate $1 for every pound of crayons collected, up to $40,000, to further The Crayon Initiative’s mission to improve the lives of hospitalized children through art and creativity. To participate, bring unwanted and used crayons to any A.C. Moore retail location and deposit them in designated collection receptacles from June 24th – August 4th. To find an A.C. Moore retail location near you, visit http://www.acmoore.com/storelocator.